Well, this was a surprise. Codemasters have released an Early Access version of DiRT Rally (a.k.a. DiRT 4). 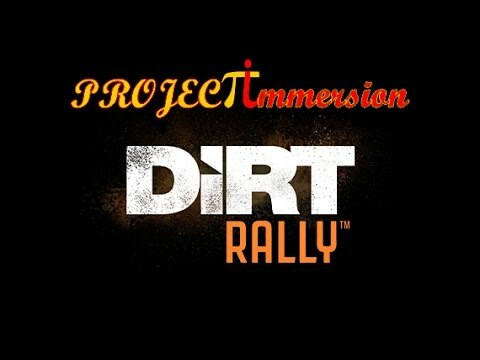 It's going to be a lot of fun that's for sure and they are shooting for the stars with this title by leaning towards a pure rally simulation. They may hit the moon and make it a sim-cade Rally title, but I'm really hoping for an RBR replacement and an interstellar achievement. As per most Codies titles this decade (and the latter part of the last one), the graphics are visually stunning with the 3D modelling of the environment not seeming to have any real effect on FPS, I wish other titles could capture this quality. It's Early Access so we should expect a few foibles that need addressing and the FFB seems to be the biggest let down right now. However, when on icy stages, you can actually feel what you should feel so that indicates a promising start to the physics, it's only when hitting tarmac and gravel that the feel is totally lacking and you get grip when you are supposed to get slip and vice-versa... it's hard to know what your car is actually doing and which way to turn the steering wheel because of this! A quick tweak here and there with a few files gave me the correct FoV and seat height adjustments and messing with another file or two gave me an acceptable feel... but I'm hoping for a patch REAL SOON to make this more enjoyable. The telemetry output is fantastic for the G-Force Motion seat I have (Geko Systems GS-105c) and throws me around as it should so I was able to complete the stage without too much trouble, I just found that I need a handbrake now.... it's my 50th Birthday soon so I'm going to get my wife to buy me one from Fanatec!